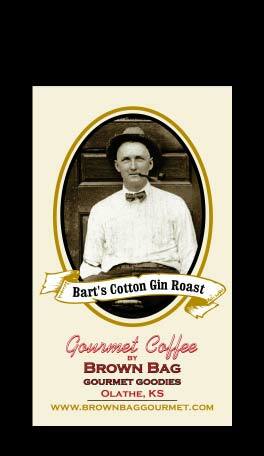 Click here for detailed coffee flavor descriptions. tastier, fresh cup of coffee. Cafe Crema Blend - Colombian and Indonesian beans, roasted both American and Full City, and blended together. This medium bodies coffee makes a wonderful espresso! Vienna Roast - Medium bodies with a crisp aroma. Lightest of the dark roasts. Can coffee change the world? Why Organic? Yes! Coffee is the second most traded commodity in the world, and for many coffee producing countries, it is their largest (legal) export. The growing conditions have a huge effect on people and the environment, so one of the best things we can do is educate ourselves about our coffee and its production. Our Organic coffees come from Sacred Grounds in California and are certified organic in California. We hope you will try our selections. Available in 6 oz $5.25 or 12 oz $10.35 Whole Bean or regular and Day Dreamer Decaf in 6 oz $6.25 or 12 oz $12.25. Need it ground? Add $.25 a bag please. New Moon Dark Roast: Our most populat blend! Dark and rich, this blend of Central American and Far Eastern coffees wil please all dark roast lovers. 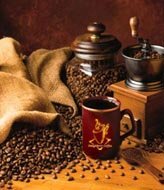 Guatemalan Aroma Roast: High grown, clean and bright, this coffee is âaromaâ roasted, enhancing its natural complexity, while preserving its lighter notes. Bolivan Colonial â This exotic, Vienna Roasted coffee is high grown, balanced and spicey with hints of chocolate. Water Processed. Day Dreamer Decaf â Too good to be called decaf! This coffee has undergone the original, trademarked Swiss Water Process; the only QAI approved chemical free decaffeinating process in the world. Whether you want to enjoy a variety of coffees, or just occasionally add a different flavor to your morning routine, here's just the ticket. These pots come pre-ground. Each packet contains 1.5 oz of delicious ground coffee, enough for a perfect 10-12 cup pot. Only $1.75 each or $1.85 for the decaffeinated flavors. These coffee creamers turn a cup of coffee into a dessert. They are non-dairy and have less than half the fat of other creamers. Lightly sweetened they come in 8 flavors. 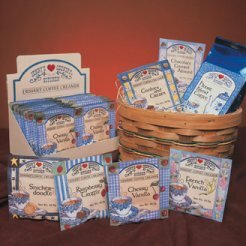 Choose from: Raspberry Truffle, Cookies & Cream, Snickerdoodle, Cherry Vanilla, French Vanilla, English Toffee and Chocolate covered Almond. $.85 each for individual packets.